The two big parties contesting the March 23 NSW Election have made commitments to Bega Valley sporting facilities four weeks out from polling day. The Liberal Member for Bega, Andrew Constance has announced $13.5 million for the Bega Sporting Complex, the Pambula Beach Sporting Complex and Merimbula Basketball Courts. “At a time where being active is on everyone’s radar and where we are seeing participation in sporting codes growing each year across our region, especially women in sport, it is only right that our players and spectators have the best facilities to train and play on,” Mr Constance says. The Bega Sporting Masterplan prepared by Bega Valley Shire Council will see an $8.5 million redevelopment taking in Rugby League, Soccer, Cricket, Little Athletics, Tennis and Hockey. “Bega will see the construction of a new indoor multi-purpose-fit for use stadium, upgraded lighting, club rooms, canteens, seating, new amenities blocks and parking,” Mr Constance says. In the south of the shire, Pambula Sporting Complex scores $4 million for facilities that include two new soccer fields, a dedicated equestrian arena with holding yards and wash bay, replacement of the Frank Maher Pavilion, upgrades to the top pavilion, new lighting, seating and formalised road access. And “Merimbula Basketball Courts will now be covered and playing surfaces improved following $1 million being allocated for the project,” Mr Constance says. “This will allow the local Basketball competition to grow, provide better safety for players and allow play to continue regardless of whether conditions. 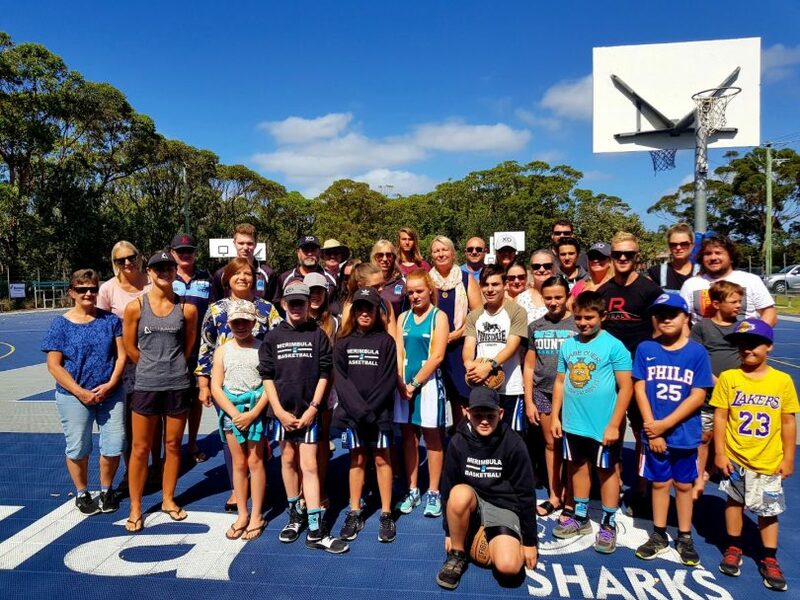 Leanne Atkinson with users of the Merimbula Basketball Courts. Photo: Supplied. Meantime, Labor’s candidate for Bega, Leanne Atkinson has announced that a Daley Government will also put a roof over the Merimbula Basketball Courts with a $910,000 pledge for the space on Ocean Drive. Ms Atkinson says the four outdoor courts and the adjacent clubhouse are heavily used by the community, including the district netball and basketball associations, sailors, kite surfers, surfers, and Merimbula PCYC. “Covering the courts will significantly increase their usage during the sweltering daytime heat of summer and the rainy months when slippery matches are frequently called off,” Ms Atkinson says. The proposed roof would be similar to that in place at Club Sapphire over the town’s bowling greens. “The sad thing is people have been advocating for this project for some time but funding only happens during an election campaign,” she says. The Labor candidate says she sees value in the redevelopment plans for the Bega and Pambula Sporting Complex and will take both projects to the shadow sports minister for consideration. Battle for Bega – What happened this week on the NSW Election trail?